I was born in Enniskillen, Northern Ireland in 1972 and almost immediately started growing. At age 6 weeks the family moved job-lot to Cheshire, England. I came with them. I went to school pretty much every day that it was open and gained a place at Bristol Vet School. During the final year at college the BBC approached the University with regards to filming a docu-soap on the lives of final year vet students. I was one of the students selected to be followed. The resulting series 'Vet School' was unbelievably popular, leading to the continuation of the series as 'Vets in Practice'. I worked for 3 years in mixed practice in Lancaster, England treating cows, sheep and all the usual pets, whilst being filmed on and off for this whole period. I was very fortunate to be asked to travel round Southern and Eastern Africa working alongside Wildlife Vets to make a series called 'Vets in the Wild'. I had always been a huge fan of wildlife books and programs and I couldn't believe my luck that I was getting the opportunity to get hands on with some of the animals I thought I would only get to see on TV. Trude and I wrote a book to go with this series which has lots of stunning photographs taken by our talented fixer Andreas Bifani. 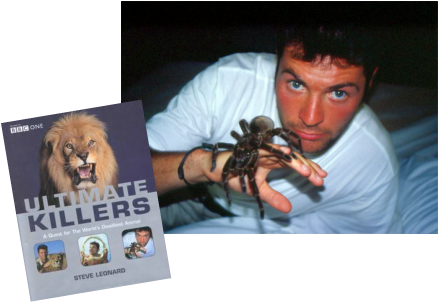 presenter for a series called 'Ultimate Killers'. Martin Hughes-Games the series producer came to see me in Lancaster and that was it. I was off round the world getting intimate with all manner of creatures. There's also a book to accompany this series. This was the first book to feature some of my own photos. 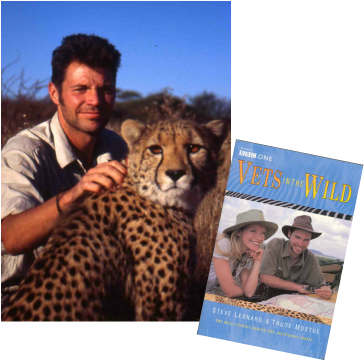 So, since 1999 I have been working as a Wildlife Presenter for the Beeb, ITV, Animal Planet & Discovery. Other series include: Extreme Animals, Journey Of Life, Incredible Animal Journeys, Orangutan Diaries, Safari Vet School, Nature's Newborns and The Wonder of Dogs (for a more comprehensive list see TV Work page). Occasionally, I will appear on TV and Radio news channels giving opinions on veterinary & wildlife topics as required. Amazingly, I still spend most of my work time as a Small Animal Vet (that's pets not little animals) and live at home in Cheshire, England with Bruce the Awesome Cat, Cathy my Incredible Wife and Severn our fantastic daughter!